"I'd like to thank all those who have worked on the modding team, all those who have served as Outsource freelancers, all our beta-testers, all those who have given their kind permission for us to use their music, matte paintings, and other assets in the mod. And, last but not least, to all the players who have, do and will download and play the mod. They can continue to enjoy it for years to come, long after the modding has stopped, because, of course, adventures never end..."
What is The Fourth Age: Total War? The Fourth Age: Total War is a modification for Rome: Total War - Barbarian Invasion 1.6 set in J.R.R. Tolkien's Middle-earth during the Fourth Age. The mod is themed around two concepts: (i) It is the age of Men - Elves, Dwarves and their kind are fading away; (ii) A dark cult is spreading among the nations of Men. Both of these concepts are grounded in Tolkien's writings concerning that period. 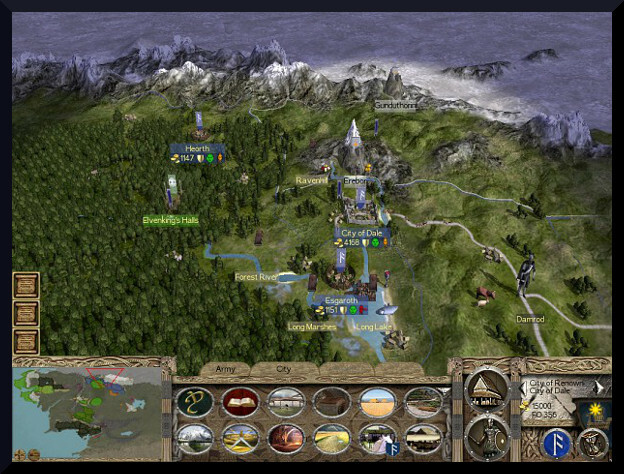 The mod was previously released as a series of modules (Corsair Invasion, Forth Eorlingas, and The New Shadow), but the The Fourth Age: Total War - The Dominion of Men is a full release covering the entire map of Middle-earth (as found in the books) with a full complement of 18 factions. The mod is based on and inspired by the books and uses original concepts in artwork and design, with carefully selected music all included by permission of the composers. We even had a matte artist create an original matte painting for us (The City of Umbar). We've endeavoured to stay true to the spirit and lore of Tolkien's world whilst also creating an innovative, stable, balanced, high quality and highly replayable modification. Who else is involved in the project? There have been many involved over the years. Some notable mentions include Aradan, who has done an enormous amount of coding work for the mod, Apocalypsis (a former lead developer with myself), Eorl (environments), Balbor (unit modeller), webba84 (battlemap modeller) and CountMRVHS (text). We also outsource (to those who generally work on assisting more than one mod) and have had great support from such TWCers as Bercor and Joar. I bring Aradan his tea and relentlessly assail the team with well-placed witticisms whilst trying to fill in the gaps and generally assist. After all, I have retired. How long has this mod been in development? Well, that's not easy to answer because we've redone a lot of the work (sometimes several times) and had breaks where we've done other things - Creating Viking Invasion II, Norman Invasion, Gods & Fighting Men, modfoldering Europa Barbarorum 1, to name just some. The first discussions for the mod began in August 2004. Work got seriously underway between 2005-7, then somewhat of a hiatus after the release of The New Shadow in which other smaller mods were completed, and then we've been working on it 5 years under Aradan's lead and now under webba84's. Although the other mods delayed the full release of FATW, the experience and reworking has led to a superior mod, one that has been thrice-forged in the furnaces of Middle-earth one might say. Has it been difficult translating this setting into the base game? What have been some of the hurdles you've had to overcome? That could take a long time to answer, and Aradan can probably best do that. In general, the Total War game has a certain way it works as an engine. We've tried to set up our world in such a way as to allow for that. That was part of the reason for choosing the Fourth Age as a setting - the storyline is open and thus allows for a scenario of total war, which ultimately the game engine is set up to provide. Having said that, we've put in a lot of effort in setting things up and creating mechanics that favour the spirit and lore of Tolkien's world. Ultimately the player can do what they want, but we have tried to provide a pleasant experience for those who try to stay true to their chosen faction's nature. One thing we didn't want to do was to create a background script that constantly seeks to restrict a player to a certain way of playing. We favour more subtle methods. The player should feel free whilst at the same time believing they are in a world that is true to the spirit of Middle-earth. What's the current status of the FATW mod? We have an open-beta that was released on the eve of 2015, a closed beta which (as of the time of writing) is updated to around mid November 2015, and a dev. build which is slightly more progressed than the latter. Yes, it's complicated The chief - and critical - elements remaining as of writing are tying up loose ends with the traits and completing the remaining Dwarven buildings. There are a few other minor things to do, but that's about it. We are set for a release in December. What advice would you give to those wishing to start large-scale projects such as this? Don't. Not unless you are willing to give up a lot of hours per week and commit to learning a great many new skills on the way. Not unless you can see it through regardless of what life throws at you. Not unless you can work to deadlines and set realistic goals. Not unless you are willing to lead by example and learn to focus (don't do something stupid like try to work on two or more mods at the same time). Unless you have the mettle for it, join a team that is working on a similar mod to the one you'd like to create, or work on a submod of an already-polished mod or start off with a mini-mod of some description. New modders seriously underestimate the amount of work a full-conversion mod requires. Remember that CA put 55 man-years into the Rome: Total War engine and its files. For example, rewriting the in-game text alone is the equivalent of writing an 80,000-word novel - and that is by no means the largest part of a modding project (and doesn't include all of the text either, such as all the advisor text). Read some of the advice articles on the modding forums written by former modders (there's even one or two written by me!). Is there anything you had difficulty adding to the mod or couldn't add but would have liked to, due to the limitations of the base game? There are some issues that are just hardcoded - such as the mismatch between AI diplomacy and what the faction's armies actually do. Some unbalanced areas have been addressed as best we can, but they are not perfect. Trying to simulate how strongly fortified a settlement is, for example, must mostly be done through the firepower of the walls. It's not perfect, but it's the best way. Of course, it has no value if the battle gets autoresolved. We have used a method to better balance all autoresolved battles through the use of the secondary hitpoints for units, but it will never compare to actually fighting the battle yourself. But really we've eeked some amazing mileage and features out of what we've had to work with. I think players will see that. What's your favourite aspect of the mod? And, on that note, your favourite faction? 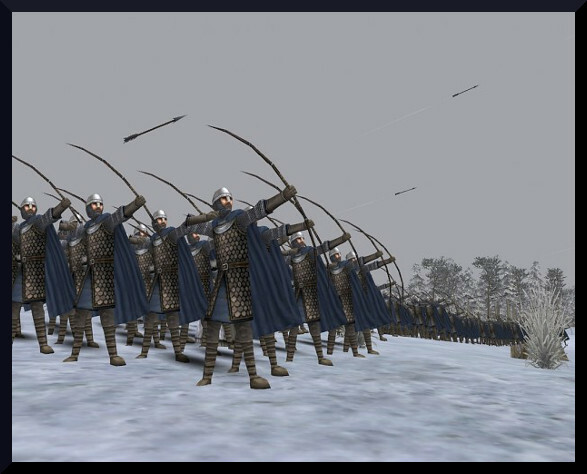 We've tried to make The Fourth Age: Total War - The Dominion of Men highly replayable. This is one of the chief "musts" of a good game and a good mod. Although stability, balance, storyline, lore, and visuals are big pluses in the mod, it is the innovative use of game mechanics and the purposeful distinctions made between cultures, factions (and even within factions) that add most to the replayability. We've maxed out the game in terms of cultures (adding an extra one beyond vanilla - which is the most you can have), factions and various slots, such as building trees - and done it in a very efficient way so that we get even more out of them. My favourite faction is the Kingdom of Dale. I think one of the reasons for that is that this faction represents in many ways the real theme of the mod: the dominion of Men. Dale is not barbaric, but they are also not part of the old dying Dunedain kingdoms. As a faction they have more propensity for assimilating other technologies and spreading across the map. To me they are the signature faction of the mod, but don't worry if you're not a Bardingphile, there are plenty of other factions to play! What are you future plans for the mod, anything you are planning to add or would like to add after full release? I'll be retiring (properly) after the release, but the current lead developer (webba84) may consider releasing an enhancement add-on to the mod. Ideas for its content include creating more unique settlements, possibly some more voice work, and minor tweaks and improvements generally. What feedback have you been getting so far with the mod? Are you happy with people's responses? We've purposefully not broadcast the release of the open-beta beyond TWCenter (and Moddb on which the file is hosted) and so downloads are no where near the amount the mod usually has seen. We didn't want the open-beta to be the default version people would find when searching the Net, even after the full version has been released. But we've had some splendid reviews and feedback from the public. TWC recently ran a video review of the mod, which was very well done. I think that sums up the mod quite well, though there is much more to it than could fit into such a short video. We also must give a shout out to our internal beta testers who've provided valuable feedback these last couple of years. The mod is so much better for it. Were there any points during the process that you felt like quitting, or did indeed leave and, if so, what caused you to stay with it? I dislike not finishing things, even to the point of making foolish sacrifices. I'm the sort of person that likes to focus intensely on a project to get it finished rather than string it out and fit it in where I can (we got Viking Invasion II done in just 3 months). Both approaches have merit, of course, but I favour the former, perhaps because I find it hard to concentrate on more than one thing at any given time. I did quit on Gods & Fighting Men (an Alexander mod based on a portion of the Irish mythos) because of time constraints, but eventually got back to it and finished it up. I stepped down as lead developer of FATW some years ago, but retirement has eluded me because I want to see it finished. I had hoped it would be released as early as 2011, but with the vision of the mod expanding somewhat, and real-life distractions and issues among key team members, the release date has been delayed considerably - though work has never ceased on the mod, it just slowed down a great deal. The team is, of course, much smaller now as well. The desire to quit can be strong, but I don't like quitting things I have made a strong commitment to (and have put many thousands of hours into). I hope that work, that sacrifice, from all team members, is seen and valued in the eventual product. How does it feel being so close to finally finishing the mod and what do you think you'll miss most about modding when you can finally say "it's done"? It feels great to know we are so close to completion. I feel very proud of the work. We've had some of the best modders work on it. 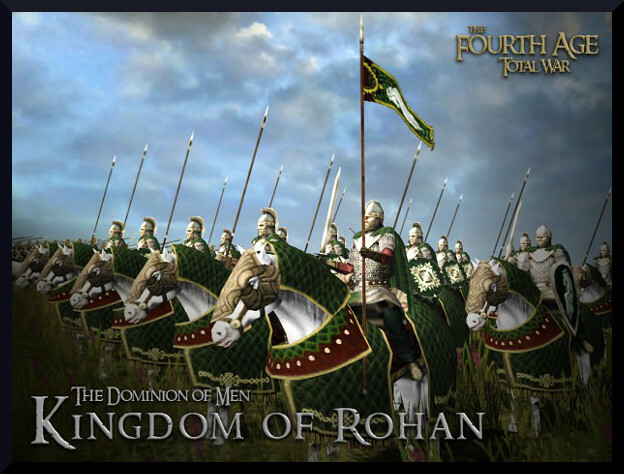 I don't think any mod can boast a more efficient and innovative use of the mechanics in its features than The Fourth Age: Total War - The Dominion of Men, nor any closer to the spirit of Tolkien's lore. Aradan, who took over from me, pushed things so much further. He, like me and the current lead developer (webba84) are perfectionists - both a blessing and a curse in modding - but I think it all worked out very well. Now that you've retired have you any plans to get back into modding fully? No, but I've enjoyed the journey. I need to spend more time doing something lucrative! How did you first get into modding? I didn't know what modding was until around October 2004. I'd made little scenarios for things like Age of Empires - but using level/scenario editors is not the same as modding. In October 2004 I came across the Fourth Age mod on the now defunct Stratcommandcenter.com (I can't remember why I was on there) and became interested in the project. I joined to advise on map lore. The rest is history. What would you say have been some of the best moments in your modding career. In terms of work done on both this and other mods? I think the best times were in the early days of researching the then-new Rome engine. There were a dozen or more of us advanced coders at that time, exploring the new engine and working out what made it tick. It was exciting to make new discoveries and get the game working in ways that the original developers perhaps had never envisaged. I really enjoyed creating Viking Invasion II and Norman Invasion. The historical research was fun, especially finding out all about the various British counties and Irish provinces. I think games should have an educational element and I believe VI2 and NI provide that. Even in The Dominion of Men we've provided markers on the map which give information about the geography, and information buildings which tell players about the regions and even which settlements are based in lore and which ones are for gameplay purposes only. I did this, in part, to avoid seeing the names I constructed ending up on Middle-eath sites and forums as if they were penned by Tolkien. I've seen a lot of that over the years and wanted to take measures to limit its chances of happening. What's your favourite Total War Game and why? I know a lot of people enjoyed the original, but I liked the better 3D of Rome and its add-ons. It was my first game, but I did buy the Medieval: Total War series too. Medieval II was quite good, though it failed to live up to Rome's engine in some areas - but I played a lot of it and Kingdoms. I enjoy both Rome and Medieval II, but would have to go with the former because of its smoother 3D and better AI pathing. I lost interest in the rest of the series because they just seemed to get less flexible for modding and more graphically top heavy...and I don't have a gaming PC anyway. I'm not really a gamer. Played a little M&B and some of its mods to complement TW and its mods, but very little else. I prefer making mods for others to play. Have you any final thoughts you'd like to share? Only that I hope players enjoy the mod. We've thought about The Dominion of Men from every angle. This is no dry mod with a sole purpose of being faithful to Middle-earth lore at the expense of being fun, nor one aimed simply at the superficial player. 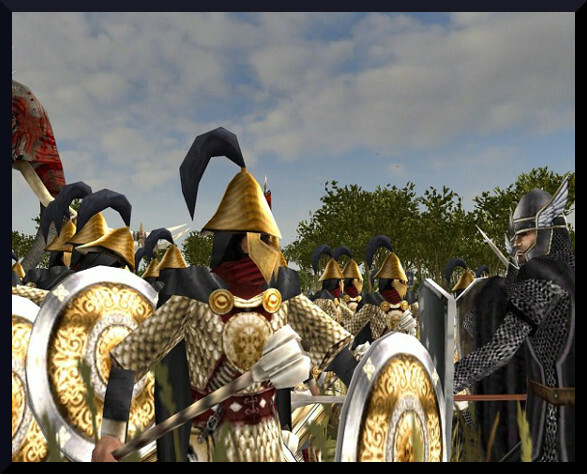 It is so much more: Stability, innovation, visuals, rich text, storyline, balance, presentation, new features, replayability, roleplayability (traits), lore friendly, fully modfoldered, intuitive, thoroughly tested and - imho - the pinnacle of Rome: Total War modding. It is our thrice-forged mod! Many thanks to MasterofNone for his kindness and patience; we apologize for the delay! For the joy and excitement of all its fans, Fourth Age: Total War has been recently released! Congrats on the release, looks epic.